Merseyswede is a family business run by Roy Hedges and his brother Derek. 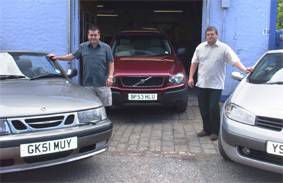 Back in 1987 when the business started they felt there was a need for an independant Saab and Volvo specialist aimed at both the enthusiast and general owner wanting a prestige car without the high cost usually involved. Both Roy and Derek both have a great deal of experience, particularly of Saabs. Merseyswede get a lot of repeat business from satisfied customers, many of whom have been customers for over 20 years. With a combination of friendly service and low prices compared to main agents. "I have just collected of my 5th Saab from merseyswede, its superb as always! I have been a customer for over 20 years. Roy and Derek have always been fast, efficient and helpful. the service I have received has been second to none and I have been proud to recommend them to others. They also look after my business vehicles for service and repair even though there not swedish!" "Want help and information? speak to Roy or Derek. always prepared to help even when closed! I've pestered Roy many times on his mobile in the evening or of a weekend, and when it comes to servicing my Volvo I cannot fault them. I have converted most of my family into customers of theirs!" "I have been an enthusiast for over 40 years. finding Roy and Derek was a real stroke of luck! they were able to provide me with parts at prices significantly cheaper than the dealers, and also finding second hand parts when needed. I now run two Saabs and would not take them anywhere else. keep up the good work!"